1. What frequencies does RFID technology support? RFID tags are available in low frequency (125 kHz or 134 KHz), high frequency (13.56 MHz), ultra-high frequency (860 – 960 MHz), and active frequency (2.45 GHz). 2. What is the low frequency RFID range? Although the entire low frequency band covers 30 KHz to 300 KHz, RFID systems use either the 125 KHz or 134 KHz frequencies. It is most suitable for use in situations where short range communication is important and it is highly accurate since these frequencies are not very sensitive to interference from radio waves. 3. What is the high frequency RFID range? 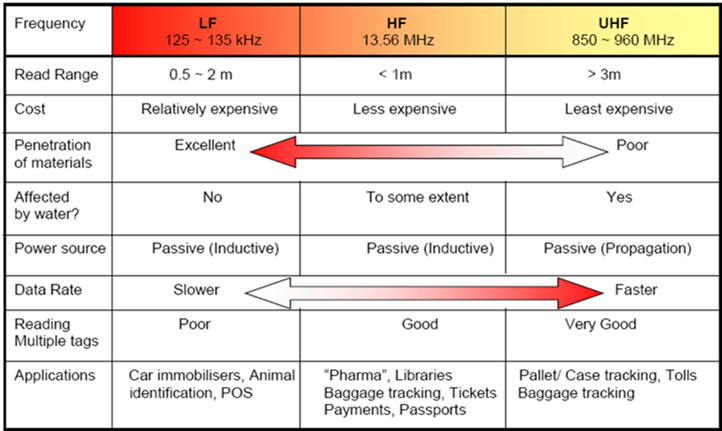 The high frequency 13.56 MHz range was internationally standardized in 1947 for Industrial, Scientific, and Medical (ISM) use, and this is why RFID uses this range. This same frequency is now being used by the popular near field communications (NFC) protocol. It is used for applications where the required reading range is within 3.3 feet (1 meter) and information needs to be written onto a tag. 4. What is the Ultra High Frequency RFID range? The ultra-high frequency (UHF) range spans from 300 MHz to 3 GHz, but there are mainly two ranges within this band that are being used: 865-868 MHz and 902-928 MHz. UHF tags can be read from a further distance of up to 40 feet (12 meters) and can be read quickly due to a high data transfer rate.